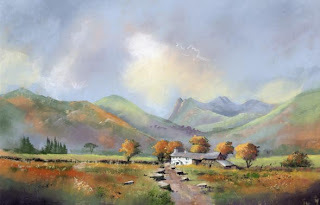 Although I work in watercolour, I do some painting in other mediums, one of which is pastel. I have neglected it for many years and keep promising myself to do some more, especially when I see what Jenny is producing these days. If you find watercolour difficult, or maybe you are in a rut at the moment, why not try pastels? They make a wonderful change, and you can always return to watercolour later. Many artists find pastel painting so much easier, but some don’t like the dust and mess on their fingers. Jenny has excellent ways of managing pastel dust and the mess on your fingers, and she is only too willing to show you her methods. She has superb techniques for creating areas of tranquil water with reflections and sparkling highlights. 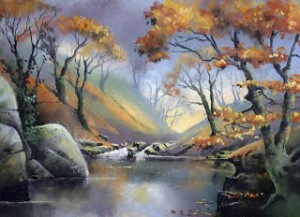 On the right you see one of her paintings of the Clydach Gorge with reflections in deep water. Pastel, with its rich colours, is excellent for autumnal scenes, which can at times be tricky in watercolour, especially when you want to juxtapose light yellow or orange foliage against a darker background. The medium is also much more forgiving – you can alter features fairly easily compared to watercolour. Pastel is also great for fading away the more distant features, as you can see here. One of my favourite subjects is rocks, and I’ve just seen Jenny’s latest works on rocks, and they certainly have the WOW! factor. Check out Jenny’s blog where she gives free tips, but if you’d really like to give pastels a try why not enroll for her course in Lynmouth from 20th to 23rd May, when she’ll be showing students how to paint the stunning coast and countryside of North Devon? 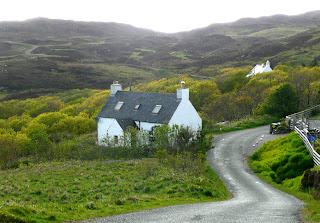 David and I have just returned home from a trip to Skye. 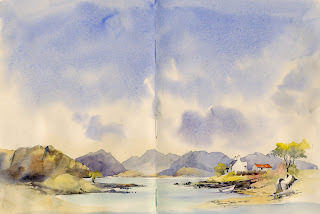 We stayed with Rosemary Hale in Aird of Sleat at her lovely coft house for a few days and for me it was sketching heaven with traditional buildings in every direction against a backdrop of mountains and islands. There were so many scenes to sketch that I had to work very quickly. In these circumstances I often create outline sketches in the field so that I can capture more compositions, and add watercolour washes to these in the evenings. That way I have plenty of material to work from when I return home and return with a feeling of having done justice to the plethora of subjects. By adding the watercolour washes to the sketch the same evening, the colours are still fresh in my mind. Sometimes I make colour notes on the pencil sketch to remind me. Working this way I can produce 5 or 6 sketches a day instead of just one. This sketch was done on a walk along the shore at Lower Breakish. 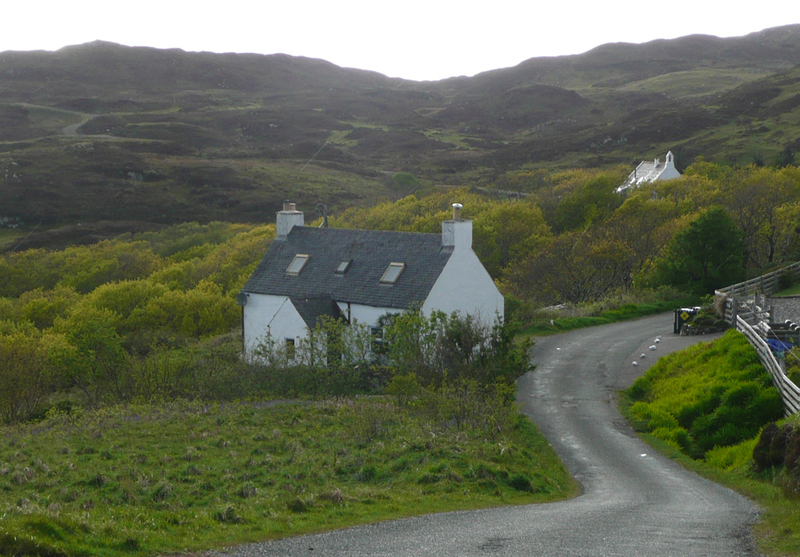 Towards the end of our stay on Skye we spent a couple of nights with Helen Stephensen at her superb Bed and Breakfast, Sealladh Alainn, in Lower Breakish. 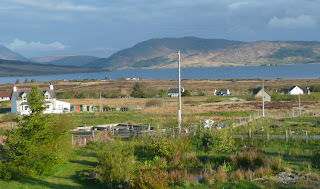 The views from the breakfast table across the Loch were stunning with subjects to draw and paint in every direction. David and I are both demonstrating at Patchings Art Festival on 14th and 15th June. Come along and say hello to us there. Here I am again harping on about the advantages of sketching in front of your subject over taking a photograph. Well I make no apologies, these two images illustrate the point perfectly. 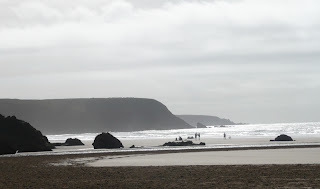 In the photograph the intense light has reduced the headlands and rocks on the beach to silhouettes. The photograph was taken with a small digital camera and unless you are very familiar with all the functions of your camera this is the most likely result you will get. Luckily I had time to sit and sketch the scene as well as take the photograph and as you can see the eye can discern much more detail than a camera. I moved the rocks around a little to lead the eye along the shoreline and sketched the figures on the side of the sketch so that I could place them in the most advantageous position in the resulting painting. 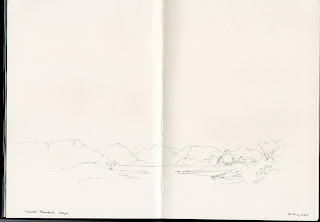 Pembrokeshire is my favourite area of the UK for sketching. 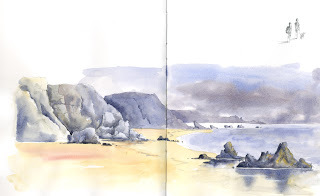 There is so much variety of unspoilt coastal and rural scenery that there is always something exciting to sketch whatever the season or the weather. One of our most popular courses takes place in St David’s at the Warpool Court Hotel overlooking St Non’s Bay. The good news is that due to the economic climate we have negotiated a considerable reduction in the price of the course this year. You can find details here. Do come and join us, you can paint in watercolour or pastel as both David and I will be tutoring this course.